Those of you of a certain age will remember a snooker player called Steve Davis. Nice guy, and very successful, but not exactly what you would call an exciting player to watch. He just did the job, very efficiently, and collected prizes. There was a photocopier company who used him in their TV ads - "Boringly reliable copiers" was their tagline. The general opinion, certainly among my esteemed colleagues in the motorcycle press, seems to be that the VFR is the Steve Davis of motorbikes. Worthy and capable, yes, but also rather dull. Not, I have to say, that the public found that to be a problem. The VFR has always been a good seller here, perhaps because you, the buying public, are more interested in getting something that will do what you need rather than the latest fashion tool. Which is a good thing. Perhaps you also remember Ron Haslam taking a totally standard VFR from a dealer and acquitting himself extremely well at a very wet 1985 Transatlantic race weekend at Donnington against full blown factory racers. Oh yes - the VFR may have been dull and dependable but it has always been fast and been blessed with better than average handling. This latest incarnation of the VFR has a little extra something. VTEC, Honda's variable valve timing, has been around in one form or another for ages, although you're probably more used to seeing it in a car than on a bike. Engines biased towards touring have their valve timing set to produce optimum power and torque without relying on revs, the result being that they soon run out of steam when things get more frantic. Sportier engines have a valve timing that makes them far more efficient at higher revs, producing far more power with similar torque, but being typically gutless at slower speeds. The principle of VTEC is easy enough - at lower revs the valve timing is softer and at a certain point the timing changes to unleash the rev monster that was always lurking in there. In the VFR, this happens at 7000rpm and is accompanied by both a distinct change in noise and in attitude. Mild mannered Bruce Banner, if you like, has got cross and turned into The Hulk. Well, that may be overdoing it a bit. Boringly reliable Steve Davis has turned a little nasty. And he's all the better for it, too. There's a bit more going on here than initially meets the eye. Put simply, the numbers don't add up properly. Riding the bike makes it very clear that this latest V-four is blessed with ample power, it is a beautifully torquey motor and the bike itself is light and well balanced. Which would be fine except that the bare figures suggest the engine isn't particularly powerful, isn't especially torquey and is bolted into a bike on the heavier end of the genre. Now I don't know how Honda have pulled this trick off, but they've done it very convincingly indeed. The VFR pulls well from low revs and has a beautifully linear power delivery right up to, and indeed slightly beyond, the red line. There is a step when the V-TEC kicks in, but how much of that is psychological as the noise changes so dramatically I can't be sure. I'll just say that I never once found the VFR lacking in performance or flexibility. Now at various times in the past I have referred to preconceptions, and this is a bike about which there must be more than most. Many people will say that the VFR is boring. That it is just so capable that it isn't exciting, that it is somehow less of a bike because it can seriously be considered all things to all people. Not true. None of it, in fact. It isn't boring - nothing with this sort of performance could be fairly be called boring. It is incredibly capable, but that doesn't detract from the fact that you can have a laugh on it. There is no way that it could really be all things to all people - in fairness it will do everything as well as most riders could handle, but then again so will just about anything else that isn't a scooter or a learner special. But the majority of the biking public's preconceived prejudices are reserved for one particular feature of the VFR. Linked brakes. Honda have been using them for a while, and it's interesting that when Moto Guzzi had them on their entire range, including the fire breathing Le Mans, back in the 80's, enthusiasts raved about how great they were. Why, then, is everyone so set against Honda doing the same thing? Not something I can objectively answer, because I was firmly entrenched in the same mindset. I don't like linked brakes because, well, just because. My Guzzi had them and they were fine. But now, 20 years on, I don't like them. Well, that isn't totally true. In fact, if you listen carefully you can hear the rare sound of a journalist eating his words and admitting that, shock, horror, he was wrong. Yes, it's true. While I didn't notice any massive improvement from having them, I didn't notice any downside either. The VFR brakes are pretty much like the rest of the VFR. Effective, usable and perfectly integrated. For the record, by the way, Honda cite the following as the main reason behind fitting linked brakes: "The CBS system, in most emergency situations, offers greater braking efficiency than a conventional system. 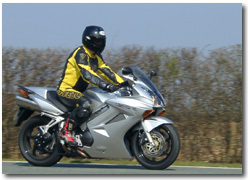 For example,a rider performs an emergency stop only using the front brake lever. As the system is linked they will get some additional, and proportional, braking force from the rear, without even thinking about it." Well, it seems perfectly reasonable and certainly doesn't have any adverse effects that I could find. If you can think of a downside, would you let me know, please? Right, enough pontificating, let's actually ride the thing. Moving the VFR around before getting on, the first thing that strikes you is the lack of apparent weight. It really is extremely well balanced. Something else that strikes you will be the, um, distinctive appearance. Well, at least Honda can't be accused of putting form ahead of function. Once in the saddle, everything falls readily to hand. No, I mean everything is exactly where you want it to be. Again, I don't know how Honda do it, but they seem able to make a bike that fits everyone perfectly straight away. It's a neat trick. Start the engine, look at the tacho to be sure it really has started - yes, it really is that quiet and smooth - get yourself settled and off you go. Pulling away the VFR is smooth but not exactly ripping the tarmac up. Build a bit more speed and the fairing shows that yes, it works quite well. The mirrors don't blur at all and give a pretty reasonable view. Instrumentation is admirably clear, with a large and quite accurate fuel gauge, twin trip meters, clock and air temperature gauge. If your journey happens to be taking place at night, you will be treated to the best headlights I have ever seen on a bike. They are way better, even, than most car drivers get to use. Pretty they are not, but my word they're effective. At some point it's quite likely that you will encounter a corner. This, at least on the VFR, is a Good Thing. The handling was, to be honest, a bit of a surprise - I was expecting something that would handle reasonably well, but I wasn't expecting something that would take one of my favourite stretches of road as fast and as composed as any top end sports bike. 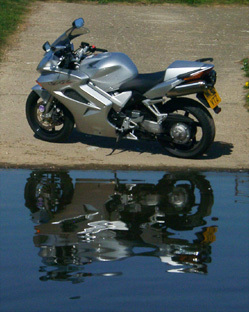 I failed to provoke a weave or any misbehaviour at all - the VFR simply did as it was asked without fuss or drama. This seemed to be the case solo or two up - the VFR is simply unfazed by whatever you throw at it. Getting between the corners isn't a big deal either. There is plenty of power, although things get more interesting with higher revs, and once the V-TEC has kicked in there is plenty to sustain an enthusiastic pace without resorting to frantic gear changes. Should you decide to work the box, though, you'll find that it is smooth and effective. Which probably isn't much of a surprise. There is, astonishingly enough, one area where it is just possible that Honda have allowed form to intrude over function. Underseat storage is, to all intents and purposes, non existent. Oh sure, you can get the toolkit in there, and there's room for a puncture kit as well, provided it's a small one, but that is about it. Not a huge issue on a bike like this but it is a surprise nonetheless. Some bikes just reach out and grab you. Some make you fall in love with them because of their looks. Some seduce you with their character. The VFR does none of these things. 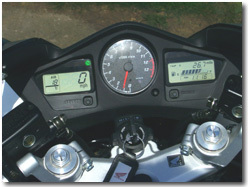 I did just over 800 miles on the VFR in the week we had it. I never once found anything that it wouldn't do (although I didn't try taking it off road) and found quite a few things it would do far better than I had any right to expect. During this time I tried to rationalise how I felt about it. But I couldn't. I didn't fall in love with it because of it's looks because I don't find it that pretty. It didn't seduce me with it's character because it, um, doesn't have much. And it didn't reach out and grab me because that sort of thing would somehow be too vulgar for it. And yet I could quite happily live with one, and I can easily see how so many people buy a VFR and then never want anything else. Quite simply, it's a fabulous bike. 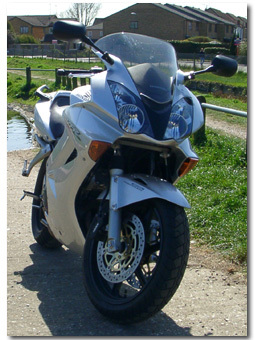 The Honda VFR has always been one of my favourite bikes. It's a comfortable and surpisingly sporty bike to ride and yet is one of the few bikes you can honestly blast off for breakfast, take the long way for lunch and then look for the longest way home for dinner. Honda has introduced many technological advances to the VFR over the years, but when I saw the first pictures of the new VFR I was stunned! I just couldn't believe what they had done. When I first saw it in the flesh I still wasn't convinced. It's a bike that grows on you the more you ride it, and the more you just stand a stare at it! The new VFR is probably the most advanced sports/tourer we have seen yet, with many new features including the infamous variable valve technology (VTEC). Simply put, the VTEC engine runs on two valves per cylinder below 7,000 rpm then cuts into four valves per cylinder above 7,000. The first thing you notice when you climb aboard, is the seating position. It's pretty much the same as its predecessors, but the pillion pegs are now 10mm lower, thanks to the new exhaust location. The rider has a new seat which is some 15mm wider for better comfort and the rear grab rails are 10mm wider. I had a chance to sample the pillion passengers view on a trip into London from Oxfordshire, all I can say is that it was very easy and comfortable for reasonable length trips, and the grab handles did exactly what Honda designed them to do. The new 'VTEC' VFR is a very together package. Most bikes in this area of the market offer much larger engines than the 781cc VFR, but not many provide such a level of technical sophistication and refinement. It has plenty of power to get by in any road based situation but if I had one criticism to make then it would have to be the lack of any torque under about 3000rpm. This is not a problem on most other sport tourers in this class due to the engine size difference, but that aside it is an absolute howl when you get it over that low torque threshold. I seemed to spend most of my time on the bike at around 7000rpm sampling the delights of the VTEC and listening to the engine note change as the power rush started! VFR fans of old will not be disappointed with this new improved version, I wasn't and I have had 4 over the years. If you can only afford one vehicle to do everything then the VFR is still one of the smartest moves you could make. Liquid cooled 781cc vee four 16 valve four-stroke with variable valve timing. 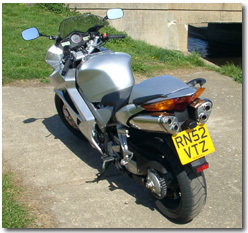 Read external Honda VFR 800 reviews on ciao.